Children’s television at 5pm sees Granada’s Junior Criss Cross Quiz, which was more popular than the adult version which Southern declined to network yesterday. This kids version is presented by Robert Holness – better known later as Bob Holness, presenter of Central’s Blockbusters. 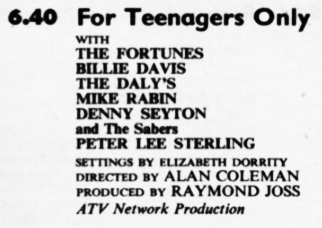 More early-evening pop at 6.40pm, this time with For Teenagers Only from ATV. This, like all off-peak ITV pop shows it seems, features second rank pop stars, this time in the Aston Studios in Birmingham. The show has no presenter as such, with the linking being done by Denny Seyton and the Sabres, who would later this month reach 48 in the charts with a cover of Fred Astaire’s 1936 hit The Way You look Tonight. Rediffusion’s Don’t Say a Word at 7pm is a sort of Give Us a Clue with words, or the US quiz show Password with actions. Each team takes turns to pantomime a word, phrase or title without saying any of the words from it, whilst their fellow team members try to guess. To make it more fiendish, the phases were impenetrable nonsense – one was “they crossed a mouse with an elephant and got a huge rat that never forgot”, which was still guessed correctly by the boys’ team. HMS Paradise at 7.30pm is fascinating. 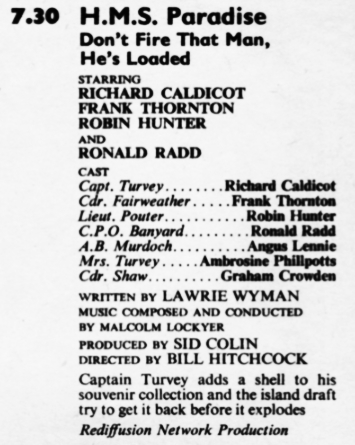 It’s much of the cast of the BBC Light Programme’s comedy The Navy Lark, playing the same characters with slightly different names, in the same setting but with the ship renamed from HMS Troutbridge, and written by one of The Navy Lark‘s writers. One can only assume that the BBC held copyright on everything from The Navy Lark except the format itself. Most odd. 8pm sees The Hidden Truth, a series with similarities to the later BBC show Silent Witness. It’s about about the new science of forensics, a subject that was just getting into the national psyche at the time. Being from before the development of DNA testing, they don’t have the wondrous ability displayed in various CSI-style series to track down a whole family of murderers from one smudged lipstick print on a discarded cigarette, so the show fills in the gaps with old fashion detective work from the medical team and a lot of soap opera-style emotional baggage. Note the young Ian Ogilvy in the cast: his fame lay before him – this is only his fourth appearance before the cameras – with his career taking off after a big role in Granada’s 1966 strange series The Liars. ITV’s flagship news analysis programme This Week is at 9.10pm. This show, which would be kept on by Thames and run until their demise in 1992 (under the name TV Eye between 1980 and 1985), was a big hit in the ratings, unusual for such a serious programme. The reporters listed show the quality of the series: Bryan Magee is a philosopher, Desmond Wilcox a documentary maker and presenter of ABC at Large, Paul Johnson a firebrand left-wing contributor to the New Statesman (and later its editor), Russell Spurr a military historian, George Ffitch a journalist and lobby correspondent, and James Cameron a famed foreign correspondent. Under the management of Jeremy Issacs, one of Britain’s finest ever producers and television executives, This Week was showered with awards and remaining editions in the archives are still watchable and interesting years after the topical events they covered have faded from memory. Anthology series – an overarching title for a series of programmes, with The Twilight Zone or without Armchair Theatre an overarching theme – were popular in the 1960s. NBC’s The Richard Boone Show at 9.40pm is an unusual example of this: it has no overarching theme, but the cast is largely the same from episode to episode, a sort of TV version of a repertory company, with each actor playing different roles of different importance from week to week. It didn’t prosper in the States, where it ran against CBS’s Petticoat Junction, which flattened it in the ratings. It was cancelled in March 1964 after 25 episodes. What the Papers Say (which had 4 incarnations over more than 50 years – ITV, Channel 4, BBC-2 and Radio 4) was a show made by journalists for journalists, the newspaper-themed equivalent of Farming Today for farmers. As such, it has a chequered history of networking across ITV: appealing mainly to journalists, it did great numbers in London, Manchester and Glasgow, the three journalistic hubs of the time. 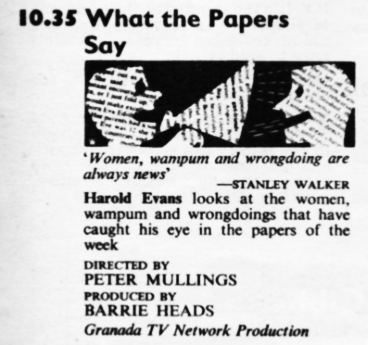 Elsewhere, with only local papers rather than national titles being produced, it didn’t gain much traction, so it pops up for periods on ATV Midlands and Southern, as here, and the like, before disappearing again just as quickly. The series is really the forerunner to the BBC’s That Was The Week That Was and its related Ned Sherrin productions, and of Private Eye, whose writers and editors became frequent hosts, in that it was very happy to speak truth to power and also to mercilessly take the mickey of the powerful at the same time. The great and good didn’t complain because they couldn’t – you don’t fall out with almost every national journalist if you can help it – and also because the programme was happy to point out the flaws, mistakes and egos within the newspapers themselves. The practice of reading out headlines and excerpts of articles in voices attuned to the aimed-for readership of each paper was a hit with the journalists – most of them then as now middle class and liberal despite the tone of their respective newspapers. As ever with a programme that speaks directly to a small (if vocal) audience with such humour and sticks two fingers up at its own viewers – and indeed everybody else – this could only be a Granada production. It’s hard to imagine any other ITV company having the chutzpah. Yesterday, we wondered if an arts review programme really counted as adult education. There are no such qualms with tonight’s Towards 2000 from Rediffusion at 11.05pm. Today the programme looks at computers (in the Southern edition of the TVTimes) or computors (in the London edition), suggesting that even the word is new and unusual. 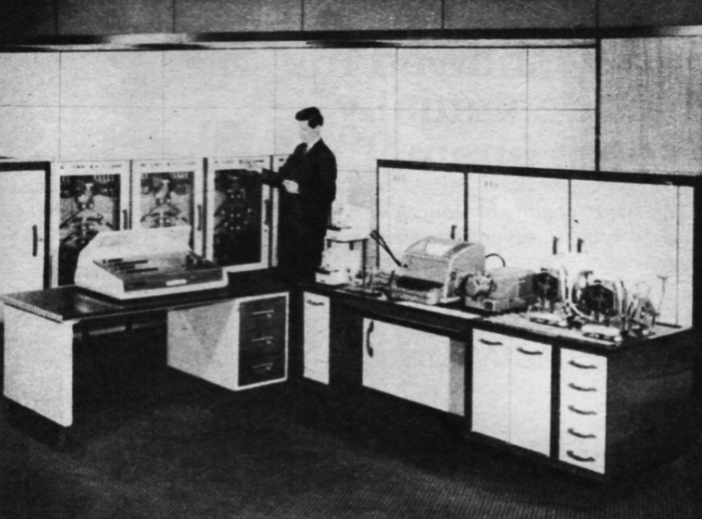 The listing is illustrated with a picture of a “compact” computer that merely fills one whole room and is mostly mechanical. Unlike the breathless tone of Tuesday’s Futurama or the forthcoming BBC Tomorrow’s World, this programme isn’t excited by the coming of the computer age. Instead John Maddox, a theoretical physicist and later editor of Nature, takes a skeptical view as to whether computers and automation will find a place in future society, and if they do, how will they change that very society they have infiltrated? This, of course, is from the point of view of how computers may make teams of clerks and typists redundant, rather than whether the internet will bring back the Nazis and illegally swing a referendum; but it reflects the similar occasional panics that grip modern media as to whether robots will replace workers any time soon. This programme was taken by all of ITV, but not every region took it at 11.05pm. Granada, for instance, moved it to noon, showing it directly after schools programmes, possibly to catch the technical colleges that were a feature of the north at the time. Kif Bowden-Smith is the founder of the Transdiffusion Broadcasting System. Russ J Graham is the editor-in-chief. At 5.25, a repeat of Richard the Lionheart (1961/62) with episode 10, this series was “The Danzigers” attempt to cash in on the ITC Swashbucklers, a lively action-packed series, last seen in the early 70s.